Alabama, first explored by the Spanish in 1540 and settled by the French in 1702, was still a part of the American frontier in the early 19th century. But the frontier areas, with land cheap and plentiful and an influx of migrants from the east, were experiencing rapid growth. Growth meant statehood, and Alabama was admitted to the Union in 1819, the last slaveholding territory granted admission before the Missouri Compromise of the following year. In 1919, when Alabama held its centennial celebrations, the state was a vastly different place. The frontier, along with slavery, had long passed into history, both swept away by the bloody tide of the Civil War. Yet, the casual mannerisms of the South still persisted and permeated most aspects of life. And so it was with the centennial celebrations of the 22nd state. 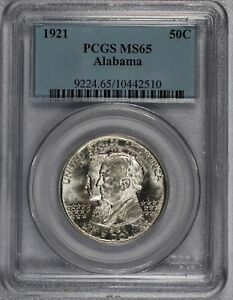 Parades and festivities were held throughout 1919, but it was not until the following year (after Alabamians learned of the profits of commemorative coinage) that the Alabama Centennial Commission promoted legislation that would authorize the striking of a commemorative quarter dollar. 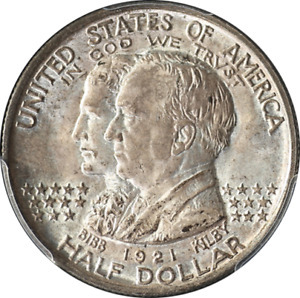 Amended in April to change the proposed quarter to a half dollar, the bill was passed on May 10, 1920. A maximum of 100,000 coins was authorized. The Alabama Commission, headed by Mrs. Marie Bankhead Owen, suggested several design motifs. 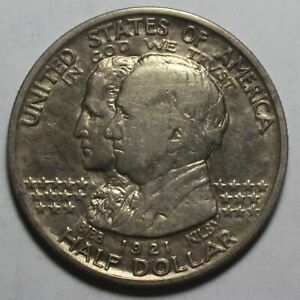 Foremost among these was an obverse with a likeness of the state capitol and a reverse with dual images of Presidents Monroe and Wilson, respectively the Chief Executives in 1819 and 1919. The Commission of Fine Arts rejected Mrs. Owen's ideas on the grounds that they were artistically inappropriate, pointing out that buildings seldom make good subjects for coinage. Almost a year passed before any more action was taken. In June of 1921, Mrs. Owen submitted her new proposal: an obverse with the Alabama State Seal and a reverse with portraits of the Governor at the time of statehood in 1819, William Bibb, and his counterpart in 1919, Thomas Kilby. 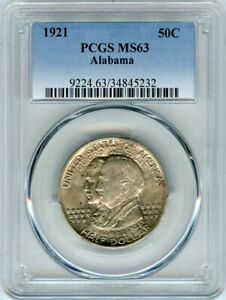 Ultimately this design was adopted, but the Alabama Commission's designated reverse became the official obverse of the issued coin. 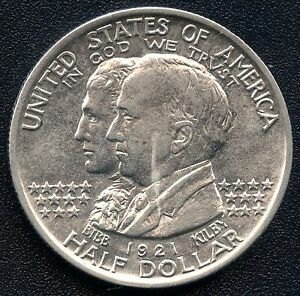 Thus, the Alabama half dollar became the first commemorative coin to depict a living individual. James Earle Fraser, the sculptor member of the Fine Arts Commission, selected his wife, Laura Gardin Fraser, also a renowned artist, to prepare models for the coin. James Fraser also suggested a "special mark" be placed on some of the coins. He knew of the success that the Missouri Centennial Committee had experienced with the addition of the "2*4" mark on 5,000 of its coins, and he suggested that the Alabama Commission might have similar luck were they to do the same. The commission readily agreed, spurning no opportunity to raise additional funds. Mrs. Fraser placed overlapping profiles of the two governors on the coin's obverse, flanked by 22 stars representing Alabama's admission as the 22nd state. 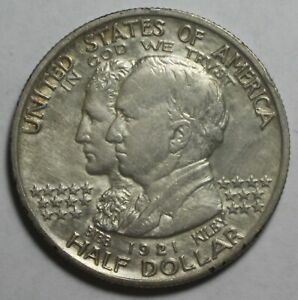 The legends UNITED STATES OF AMERICA and HALF DOLLAR encircle the periphery, with the motto IN GOD WE TRUST placed above the governors' heads. Below the portraits appears the date 1921, flanked by the two governors' names. On coins with the "special mark" suggested by Fraser, a "2X2" appears in the right obverse field. Over the years, collectors have mistakenly read this as "2 by 2" or "2 times 2"; in fact, the central character is not an X but instead represents the red, X-shaped cross of Saint Andrew, patron saint of Scotland, as seen on the Alabama state flag. The reverse features a rendering of the eagle from the state seal, perched upon a horizontal shield, grasping arrows in its talons and a ribbon in its beak. The ribbon is inscribed with the state motto: HERE WE REST. Above the eagle is the inscription STATE OF ALABAMA with the dual dates 1819 and 1919 flanking CENTENNIAL below. Laura Gardin Fraser's initials, LGF, are in the right reverse field near the rim. The coins were first distributed on the morning of October 26, 1921, as President Warren Harding passed through Birmingham to help dedicate the new Masonic temple. 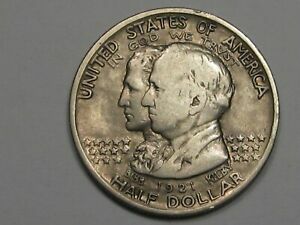 There is some dispute whether the "2X2" coins were the first struck, as eyewitnesses were not able to purchase any coins other than the "plain" pieces. There is also some disagreement about just how many pieces were struck, melted, and the net number distributed. Various reputable accountings place the number of "2X2" pieces minted at anywhere from 5,000 to 15,014 pieces, and they all make a reasonable case for their position. Currently accepted catalogs, however, maintain that 6,006 pieces of the "2X2" variety were struck with the six odd coins reserved for assay purposes. 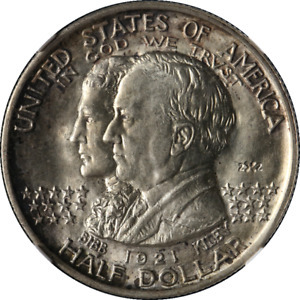 Of the "plain" halves, 64,038 were minted, with 38 assay pieces and 5,000 unsold examples melted, resulting in a net mintage of 59,000 coins. 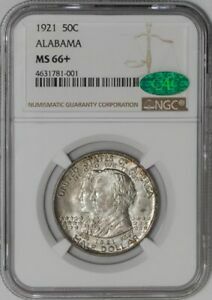 The Alabama Centennial half dollar is a challenging coin to locate in problem-free condition, but every commemorative collector needs at least one example. 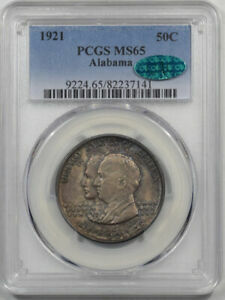 As a general rule, type collectors include a "plain" Alabama in their set, while complete-set collectors are interested in both varieties. This is not a hard and fast rule, however. 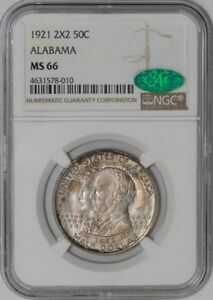 Unlike the Grant issues where there is a large difference in price between the "plain" and specially marked issues, with Alabama halves, in spite of the widely disparate mintages of the two varieties, there is little difference in actual rarity or price. 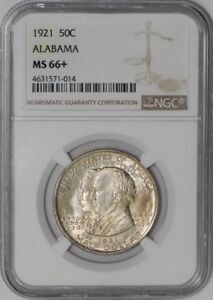 Alabama halves were sold by banks throughout the state, and most were purchased by the non-collecting public. As a result, most pieces survive in grades MS 60 or lower. Unlike many other commemoratives which never entered circulation, Alabama halves saw widespread use during the Depression, and many were carried as pocket pieces. The typical coin encountered today is likely to grade XF or AU. 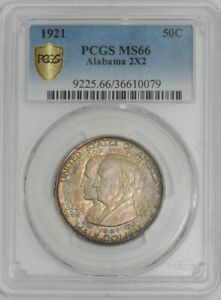 Mint state pieces are quite scarce, and high grade (MS 64 or better) examples are very elusive. Much of this issue was weakly struck, and grading can be somewhat tricky. Luster ranges from a subdued satin finish to bright and frosted, while weak areas are often confused with wear. Uncirculated examples, however, will still posses luster on the higher points of the design, namely on Kilby's upper ear and on the eagle's breast, leg and talons. Wear first appears on Kilby's forehead and cheek and on the eagle's neck, wingtip and upper edge of its wing. Some specimens are known with die-clash marks in the obverse fields, especially behind Kilby's head. Mint caused, these do not detract from the coin's value. There are unconfirmed rumors of a matte proof striking of the "2X2" variety, but no other specially struck coins are believed to exist. 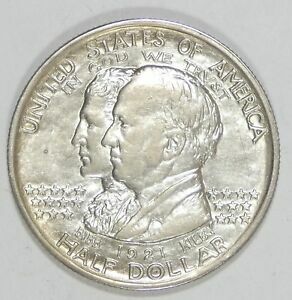 Alabama halves were the first of the artificially created commemorative issues that were to reach full bloom in the mid-1930s. Proposed as an afterthought, and inspired primarily by the commercial success of other issues, the Alabama commemorative succeeds in one area where many other issues fail: design. This is undoubtedly due to the skill and artistry of Laura Gardin Fraser, who went on to create other commemorative coins, including the universally acclaimed Oregon Trail half dollar. 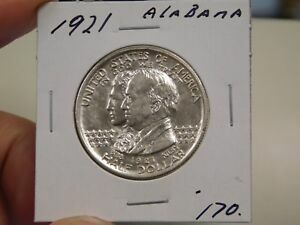 1921 UNITED STATES COMMEMORATIVE HALF DOLLAR " ALABAMA CENTENNIAL 1819 1919 "